Reference: Victor, S., 2017. Imvubu 27:1. 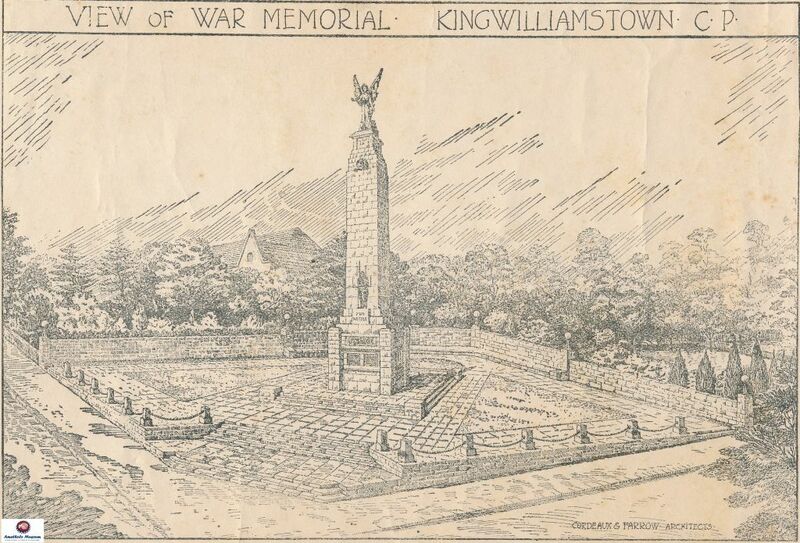 Cordeaux and Farrow's 1921 architectural drawing of King William's Town's memorial to the First World War (1914-18) forms part of the Amathole Museum's collection. Included on the War Memorial plaques are the names of men from King William's Town who died a century ago during one of the worst maritime disasters of the 20th century to occur in British waters, resulting in the accidental sinking of the troopship, SS Mendi. The names of the men are: James Pambili, George Nini, John Clout Nziba, Squire Nodolo (Dodolo), Kleinbooi Petela, July Mdunyelwa, Durward Ngcenge and Style Tetani. Lance Corporals Robert Madosi and Henry Gqweta, as well as Private Anderson Soka from King William's Town, also died during the Mendi disaster, but have been omitted from the memorial. According to the author, Ian Gleeson, the SS Mendi had left Cape Town on 16 January 1917 with members of the South African Native Labour Contingent (SANLC) on board. After calling at Plymouth, the Mendi was en route to the French port of La Havre. In the early hours of 21 February 1917, approximately 12 miles off St. Catherine's Point on the Isle Of Wight, the 11 000 ton liner, SS Darro, travelling at full speed in thick fog and sounding no fog signals, rammed the Mendi on her starboard side almost cutting her in half. The Darro backed out of the hole she had caused and the sea poured into the breach on the Mendi. She immediately started to list to starboard and sink, disappearing under the sea in about 25 minutes. Despite numerous individual acts of heroism, 615 members of the SANLC were drowned in the incident. Most of the troops on board had been asleep. For men not used to the hazards of the sea, the collision must have been a terrifying experience. In some accounts of the incident it has been stated that the men from the SANLC were mostly from the rural areas of Mpondoland in the Eastern Cape. However, a glance at the military nominal role of the dead (dated 21/2/1917) shows the foregoing statement to be incorrect because many Sotho names are included, quite apart from those that are clearly Xhosa, Mfengu, Zulu and Swazi. Be quiet and calm, my countrymen, for what is taking place is exactly what you came to do. You are going to die, but that is what you came to do. Brothers, we are drilling the death drill. I, a Xhosa, say you are my brothers. Zulus, Swazis, Pondos, Basothos and all others, let us die like warriors. We are the sons of Africa. Raise your war cries my brothers, for though they made us leave our assegais back in the kraals, our voices are left with our bodies. The veracity of the story has never been confirmed. Indeed, none of the survivors' accounts describe the 'death dance' in any detail, which might simply be myth that has become interwoven with the event. S. E. K. Mqhayi also does not refer to it in his poem, 'Ukutshona kukaMendi' ('The Sinking of the Mendi'), published in 1927. The SS Mendi sank rapidly in the dark and it is unlikely that a 'death dance' could have been organised in the ensuing confusion on deck. Nevertheless, the tradition was immortalised by the South African press. Historian Albert Grundlingh doubts the death dance ever took place. According to him, oral traditions concerning the 'death dance' were in circulation during and shortly after the Second World War (1939-1945), and are significant precisely because they mythologised the events. By the 1940s, he writes, the Mendi tragedy had acquired a symbolic dimension with nationalist overtones in collective African memory. Commemoration services, known as Mendi Day, were held annually on 21 February and became a rallying point for raising black political consciousness. The inquest into the tragedy found the Captain of the SS Darro, H. W. Stump, responsible for the collision. He was accused of having travelled at a dangerously high speed in thick fog, failing to ensure that his ship sounded the necessary fog signals. As a consequence, the Master of the Darro had his licence suspended for a year. His failure to render assistance to the Mendi's survivors was also questioned and is the source of much controversy. His ship merely floated nearby while lifeboats from the Mendi's escorting destroyer, the HMS Brisk, rowed among the survivors trying to rescue them. Among the South Africans lost were some prominent Mpondo men, such as the chiefs Henry Bokleni, Dokoda Richard Ndamase and Mxonywa Bangani. When news of the disaster was received on the 9 March 1917, the South African House of Assembly, led by Prime Minister Louis Botha, rose from their seats in respect for the dead. Despite the gesture, black non-combatants returning home from service abroad received none of the customary acknowledgements of war service, such as campaign ribbons or medals, which were accorded to combatants and nurses. Between 1916 and 1918, about 21 000 black South African volunteers served in France with the SANLC. They were not used as a fighting force and were forbidden to bear arms. Although recruitment had the active support of many African political leaders, it was not as successful as had been hoped, owing to distrust of the government's intentions. Encouraged by their chiefs and by Mqhayi's earlier poem, 'The Black Army', many did volunteer their services. The SANLC formed part of a labour force that also consisted of French, Chinese, Japanese, Indian, Egyptian and Canadian labourers and German prisoners of war. By the time the unit disbanded in 1918, the men had mostly been employed in non-combatant roles in French ports, where they unloaded ships and loaded trains with supplies for the front. The SANLC also laboured in quarries, laid and repaired roads and railway lines and cut copious quantities of timber. The Mendi dead are remembered at the Hollybrook Memorial 'For those that have no grave but the sea' in Southhampton, England, and at the Delville Wood Museum in France. In our own country, a little known memorial in New Brighton, Port Elizabeth, the Mendi memorial in Avalon graveyard, Soweto, and the Mendi memorial at the University of Cape Town (now a national heritage site) all commemorate the disaster. Next time you pass the War Memorial in King William's Town spare a thought for the men of the SANLC who died in the sinking of the SS Mendi. Cape Mercury, 11.04.1917. 'List of Victims of the Mendi disaster'. Clothier, N., 1987. Black Valour - The South African Native Labour Contingent, 1916-1918 and the Sinking of the Mendi. Pietermaritzburg: University of Natal Press. Gleeson, I., 1994. The Unknown Force: Black, Indian and Coloured Soldiers Through Two World Wars. Cape Town: Ashanti. Grundlingh, A., 2014. War and Society: Participation and Remembrance - South African black and coloured troops in the First World War, 1914-1918. Stellenbosch: Sun Press. South Africa War Graves Project. South African Native Labour Corps. [Online]. Available: http://www.southafricawargraves.org/search/view-paginated.php?page=106&ipp=10®iment=830&Regiment=830. [Accessed 27 January 2017]. King William's Town War Memorial, Alexandra Road. 'Overseas Contingent' Plaque. Recorded 17 January 2007. * This is a revision of an article with the same title which was originally published in Imvubu 19: 1, 2007: 1 & 7. The M. Robert listed on the War Memorial could possibly be an erroneous reference to Robert Madosi. 11 names have thus been identified, but it is quite possible that more individuals were involved. Rev. Isaac Wauchope (1852-1917) adopted his surname from a British General who fought, somewhat unsuccessfully, in the Queenstown-Jamestown area during the opening phase of the South African War (1899-1902). Wauchope is also known as Dyobha and published his poetry under the pseudonym Citashe.